Doctor of Medical Sciences, Associate Professor, Cardiology Clinic, Floreasca Emergency Clinical Hospital, “Carol Davila” University of Medicine and Pharmacy, Bucharest. Serban Balanescu graduated from the Faculty of General Medicine, University of Medicine and Pharmacy “Carol Davila” Bucharest in 1988 with his diploma thesis: “Clinical aspects of exploration and therapy in hypertensive cardiopathy”. In 1994 he became Medicine Specialist in Internal Medicine, and since 1998 Dr. Serban Balanescu is a Doctor of Internal Medicine. 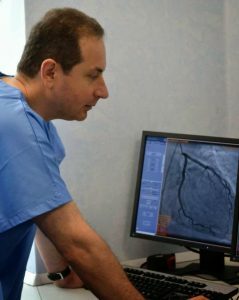 Since 2002 Dr. Balanescu has become a Cardiology Primary Physician with competence in Interventional Cardiology. Dr. Serban Balanescu “Fellow of the European Society of Cardiology” (FESC), a title awarded by the European Society of Cardiology, also has a generous journalistic activity. Dr. Serban Balanescu is the author of 131 scientific papers (as author or co-author), 79 published summaries and 8 scientific papers awarded (7 in the country, 1 abroad). The medical activity of Dr. Balanescu was not only in Romania but also internationally. Thus, between 1995 and 1996, Serban Balanescu was a Cardiologist at the Hospital Hospitalier Rangueil Toulouse, France. Between 1996 and 1997, Dr. Serban Balanescu was a Cardiology Scholar at Southampton General Hospital, United Kingdom. Dr. Serban Balanescu is a member of the peer-review committee “European Journal of Echocardiography” and since 2011 member of the Editorial Board of the Romanian Journal of Cardiology.